(Newser) – The heads of the three parties in Greece's governing coalition have reached a "basic agreement" on an austerity package for 2013-2014, the country's finance minister says. The cuts are essential if Greece is to continue receiving funds from international emergency loans. 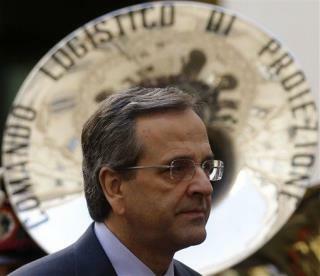 The meeting between Prime Minister Antonis Samaras and the heads of the two junior coalition parties came a day after more than 50,000 anti-austerity protesters took to the streets of Athens. Let's not let ourselves get to this point... ... U.S. debt needs to be reduced (must not reach $20T... needs to return to less than $8T) ... obviously, only way to do so is through surplus budgeting (where surplus is used to reduce debt) ... when we get over our collective "what's in it for me now?" attitude we will realize ... huge painful spending cuts, subsidies, & tax credit/deduction terminations have to be done ... large painful revenue increases (tax rates, contribution limits, fees, etc.) have to be done What say you?